Home » Downsizing: less work, lower bills, more fun! The kids are gone. Rooms stay empty and you no longer need many of the goods you’ve accumulated over the years. Maintenance bills seem to only get higher. Cleaning the house never seems to come to an end. Many baby boomers and empty nesters are considering downsizing these days. Cleaning out the house, selling it and moving to a smaller home. Getting some equity out of the home and turning that into travel and fun money. So where do you start if you are thinking of downsizing? Most want to know their present home value. So call us and we will be able to do a current market value of your home. To learn more about Calgary’s real estate market you can visit our statistic page or you can visit the live statistics from the Calgary Real Estate Board. All sold data, including home features, number of days on the market and the ratio list price vs selling price. Sold data is a great way to understand the real estate market in your community. Then, you want to know what you can get for your dollar. That is not all that easy as it sounds! Think over your wants and needs in a new place. Besides square footage and the number of bedrooms you will need, what type of home do you see yourself in for the next many years? A penthouse, a condominium or townhouse requires less maintenance and is easy to close up when traveling. Some buildings come with many features and amenities you may find important: an elevator, fitness area, underground heated parking, just to name a few. A number of condominiums have age restrictions such as 40+ or 55+. As Realtors, we are able to locate those for you. 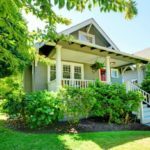 A smaller single family home gives other advantages. Important issues may be the stairs in a home. Bungalows still have a basement. However, a small yard can allow you to start the veggie patch you’ve always dreamed of! What about a sun room; wouldn’t that be great? And don’t forget about the garage. Villas are also a perfect option for downsizing. They layout is like a bungalow, but with the garage attached on the same level as the living area, registered as a condominium plan. Then, what is your chosen neighborhood? What neighborhoods offer those amenities you are looking for? Do you want to be close to friends, family, perhaps your family doctor, shops, public transport? How about your favourite hobby? Where is the nearest golf course? Calgary has lots to offer in terms of variety. Every type of property, condominium or single family home can be found in every price range. So…coming from a luxurious lifestyle? Calgary allows you to downsize maintaining that life of luxury. Many questions are to be answered before you can move forward with your downsizing plans. As Realtors, we will sit down with you and go over all options and features that you are looking for before you decide on anything. Kick start the process: what are my options and opportunities to buy in Calgary? Receive listings in your inbox for homes that match your criteria. Fill out the buyers form and let us know what you are looking for in your new home. Receive listings for some time, and get familiar with your options and possibilities. And take it from there! You may also be interested in selling or buying first and how to choose a realtor.